🎥ACV reception for ground-breaking Transgender film, ‘Ek Aasha’ – look out for interview with director Mayur, coming soon! IT IS NEARLY here! 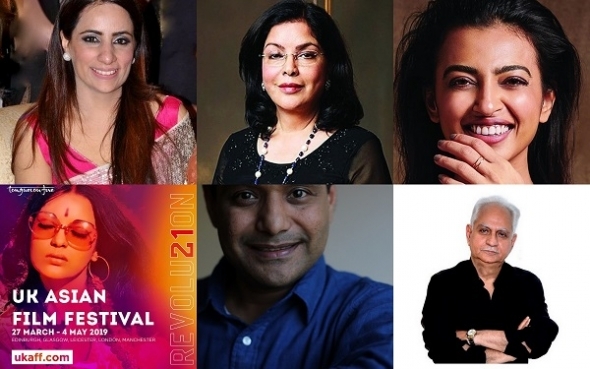 The 21st UK Asian Film Festival gets underway in precisely one week and highlights the idea of revolution – social, intellectual, and one between genders. The festival, known in its earliest incarnations as Tongues on Fire and the London Asian Film Festival, presents dozens of films, talks and special events across London, Leicester, Glasgow and Manchester – please see dates below. What screenings or special events are you especially looking out for? Are you coming to the acv reception and screening of ‘Ek Aasha’ on Friday, March 29 at Regent Street Cinema? This is a remarkable story of someone who has gender dysphoria and makes the momentous decision to join a Hijra community – but this is not without its hazards as well – as Aasha (Disha Yadav) tries to achieve her much cherished ambition of becoming a teacher. Director Mayur Katariya has spoken to us about why he and how came to make this film and what it means to him – and the community he has befriended and who have played such a significant part in first full-length feature film. Make sure you’re connected to us for the best and most comprehensive festival coverage on www.asianculturevulture.com – it all starts next week – with us on the red carpet for the Gala Opening as the fest welcomes 1970s and 1980s Bollywood pin-up and icon Zeenat Aman – described in some quarters as Bollywood’s very own Angelina Jolie. That isn’t the only special event on the opening gala on Wednesday (March 27) – see which stars walk the Red Carpet – there is also the festival’s opening film. ‘Hamid’ is a tale about a boy trying to contact God in Kashmir and his friendship with a soldier that emerges from it. Uplifting and funny in places, it’s a heart-warming, feel good film that has much to say. It replaces the originally scheduled opening gala film, ‘No fathers in Kashmir’ – which for unforeseen circumstances is no longer available to the UK Asian Film Festival. Radhika Apte is one of a new generation of stars to emerge from the Indian scene, having started out on the indie circuit and now straddles TV, films, both indie and Bollywood (having appeared in Bollywood juggernaut Akshay Kumar’s ‘Pad Man’ last year). Her recent appearance in the Netflix TV smash, ‘Sacred Games’ (2018) has put her on the international map as well – acv has seen her in the intriguing and mysterious and blackly-funny two-hander, ‘The Wedding Guest’ with Dev Patel. This film enjoyed its world premiere at the Toronto International Film Festival (TIFF) in September and acv was there and reviewed. It’s just released in the US. Also featuring at the Closing Gala event on Sunday, April 7, is Ramesh Sippy. The director behind the immortal ‘Sholay’ (1975) comes for a special chat to Bafta in Piccadilly, London. Evening Standard columnist and media commentator Ayesha Hazarika will be doing the quizzing at Bafta. It was ‘Sholay‘ that undoubtedly catapulted Amitabh Bachchan to the stardom and iconic status, he still, arguably, enjoys today. Sippy did the same for Hema Malini earlier in ‘Seeta Aur Geeta’ (1972) and has a long and illustrious history as one of Indian cinema’s most influential figures. He also visits Leicester on the Thursday before (April 4) to talk about his remarkable life in films. We will also have more on the Closing Gala Film in London – ‘Pinky Memsaab’. Set in Dubai, and criss-crossing between the high life and bright lights, and domestic drudgery and limited opportunities of menial employment, this is an unusual tale about the haves and have nots in the UAE. First-time director Shazia Ali Khan has spoken to acv about her film – its examination of friendship across the divides – of rich and poor – Pakistan and India, Muslims and Hindus and Westerners and locals. The film screens in Edinburgh and Glasgow first and makes it way to London for the last evening film screening. Be sure to read our interview and see one of the few films to go underneath the belly of expat life in that part of the world. Also attracting a lot of pre-festival attention is the celebration and commemoration of Southall Black Sisters which is marking its 40th anniversary. This campaign group which also helps support vulnerable Asian women has curated four films in association with UKAFF. These are ‘Provoked’ (2006), featuring Bollywood darling, Aishwarya Rai Bachchan in one of her grittiest roles to date. Ahluwalia successfully argued she had endured a 10-year unrelenting campaign of violence, sexual violence and oppression at the hands of her brutal husband and was set free. Ahluwalia is scheduled to appear on the post screening panel. Another film ‘Burning an Illusion’ – among the first directed by a Black British woman – also appear on the bill. Director Menelik Shabazz looks at the injustices in Thatcher’s Britain of the 1980s – a panel of activists and campaigners come together to discuss the issues and it will be chaired by well-known journalist and media commentator, Yasmin Alibhai-Brown. The other films are ‘My Beautiful Laundrette’ (1981) and ‘Brick Lane’ (2007). Both are seminal films about the British Asian experience and written by Hanif Kureishi and Monica Ali, respectively. Ali will join a panel discussion after the screening on Saturday, April 6. **Apologies on some mobiles text may be hard to read near pictures (it’s a tech issue, best to see on tablet or desktop)**.